Aims: We study a sample of five dwarf irregular galaxies in the CenA/M 83 group, which are companions to the giant elliptical CenA. We aim at deriving their physical properties over their lifetime and compare them to those of dwarfs located in different environments. Methods: We use archival HST/ACS data and apply synthetic color-magnitude diagram fitting in order to reconstruct the past star formation activity of the target galaxies. Results: The average star formation rate for the studied galaxies ranges from 10-3 M⊙ yr-1 up to ~ 7 x 10-2 M⊙ yr-1, and their mean metallicities correlate with their luminosities (from [Fe/H] ~ -1.4 up to ~ -1.0). The form of the star formation histories varies across the sample, with quiescent periods alternating with intermittent enhancements in the star formation (from a few up to several times the average lifetime value). The dwarfs in this sample formed ~35% to 60% of their stellar content prior to ~5 Gyr ago. 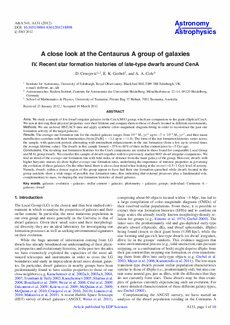 Conclusions: The resulting star formation histories for the CenA companions are similar to those found for comparable Local Group and M 81 group dwarfs. We consider this sample of dwarfs together with five previously studied M 83 dwarf irregular companions. We find no trend of the average star formation rate with tidal index or distance from the main galaxy of the group. However, dwarfs with higher baryonic masses do show higher average star formation rates, underlining the importance of intrinsic properties in governing the evolution of these galaxies. On the other hand, there is also a clear trend when looking at the recent (~0.5-1 Gyr) level of activity. Namely, dwarfs within a denser region of the group appear to have had their star formation quenched while dwarfs located in the group outskirts show a wide range of possible star formation rates, thus indicating that external processes play a fundamental role, complementary to mass, in shaping the star formation histories of dwarf galaxies.